This new smart wearable is based on the Fenix 5 platform and comes in two variants, priced at $599.99 USD (basic) and $849.99 USD (sapphire crystal display protection and stainless steel band). 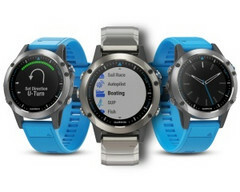 Garmin unveils a new smartwatch for those who love sailing and water sports, promising to begin deliveries next month. Dubbed Quatix 5, this smartwatch does not use Android Wear, but is compatible with Android handsets, being developed on the Fenix 5 platform. According to the official press release, this smart wearable "provides comprehensive boat connectivity with compatible Garmin chartplotters and other marine electronics to offer autopilot control, remote multifunction display (MFD) waypoint marking, data streaming – including speed, depth, temperature and wind – sail racing assistance, and much more." The usual fitness tracking capabilities such as heart-rate monitoring and various activity profiles for those who enjoy running, hiking, or biking are also present. Depending on its usage pattern, the Quatix 5 smartwatch can provide up to two weeks of autonomy on a single charge. However, the battery life drops to only 24 hours when used in GPS mode. The basic variant comes with a blue silicone band and has a suggested retail price of $599.99 USD, while the Sapphire edition with scratch-resistant lens and stainless steel band will be available for $849.99 USD. Both are expected to hit the market next month. OLATHE, Kan.- Garmin International Inc., a unit of Garmin Ltd. (NASDAQ:GRMN), today announced the quatix 5, its next-generation marine GPS smartwatch that’s specifically designed for life on the water. More than a watch, the quatix 5 provides comprehensive boat connectivity with compatible Garmin chartplotters and other marine electronics to offer autopilot control, remote multifunction display (MFD) waypoint marking, data streaming – including speed, depth, temperature and wind – sail racing assistance, and much more. In addition to preloaded marine-specific feature sets, the quatix 5 also includes a host of built-in activity profiles for land and water sports like running, hiking, biking, swimming, rowing, and paddle boarding to name a few. With an extended battery life, daily activity tracking1, smart notifications2, and Garmin Elevate™ wrist heart rate technology, the quatix 5 can be worn 24/7 and easily transitions from water to land. Built to withstand the harsh marine environment, the quatix 5 measures at 47mm and features a rugged yet sleek design with a stainless steel bezel, buttons and rear case that’s more compact than previous models. Thanks to the new QuickFit™ bands available in metal, leather or silicone, users can interchange their watchband in seconds and without tools. The quatix 5 also makes it easier than ever to mark and save a waypoint from anywhere on the boat – with the touch of a button, the quatix 5 can be used to remotely mark a waypoint on a connected chartplotter(s). And, users can also use the quatix 5 to control their onboard entertainment system thanks to the built-in FUSION-Link™ Lite app that controls connected StereoActive™ products as well as other ANT-enabled stereo models. Specifically designed for the water, the quatix 5 gives mariners up-to-date tide data downloaded for the area they’re in through a smartphone, and will have access to that data for seven days. It’s also equipped with an anchor alarm to warn users of drift and an anchor rode calculator that tells the user the proper length of anchor line to put out. For fishing, a competition timer and fish catch log are available to help users keep track of the fish they’ve caught and the time remaining before getting back to weigh-in. And for sail racing, the quatix 5 features tack assist, race countdown timer, distance to start line, and time to burn. Water rated to 100 meters4, the quatix 5 is built to withstand the elements and features a sunlight-readable color display with an LED backlight so data is easily visible in any light. With an omni-directional stainless steel EXO™ antenna and high-sensitivity GPS with GLONASS support, it has the ability to track in more challenging environments than GPS alone. The quatix 5 boasts up to 24 hours of battery life in GPS mode, 60 hours in UltraTrac™ mode and two weeks in smartwatch mode (depending on settings). In addition to the marine and multisport features, the quatix 5 can be worn for daily activity tracking so users can wear their quatix as a daily timepiece. It boasts a variety of connected features and when paired with a compatible smartphone, users can get call, text and email smart notifications right on their wrist. The quatix 5 is compatible with Connect IQ™, an open platform for third-party developers to create content for compatible Garmin wearables, so users can customize their watch with apps, widgets, data fields and watch faces. The quatix 5 is expected to be available in June in two versions: the quatix 5 and the quatix 5 Sapphire. The quatix 5 Sapphire has a scratch-resistant sapphire crystal lens and includes a stainless steel band as well as a blue silicone QuickFit band. With a suggested retail price of $849.99, it’s also Wi-Fi® enabled so users can connect their watch to their home network for automatic uploads to Garmin Connect™ when within range. The non-sapphire quatix 5 comes with a blue silicone QuickFit band with a suggested retail price of $599.99. Garmin was recently named Manufacturer of the Year for the second year in a row by the NMEA, an honor given to the most recognized marine electronics company for support of products in the field. Garmin’s portfolio includes some of the industry’s most sophisticated chartplotters and touchscreen multifunction displays, sonar technology, high-definition radar, autopilots, high-resolution mapping, sailing instrumentation, and other products and services that are known for innovation, reliability, and ease-of-use. 1 See Garmin.com/ataccuracy for more details. 2 When paired with compatible smartphone. See Garmin.com/ble for more details. 3 The helm should never be left unattended. 4 See Garmin.com/waterrating for more details. Garmin International Inc. is a subsidiary of Garmin Ltd. (Nasdaq: GRMN). Garmin Ltd. is incorporated in Switzerland, and its principal subsidiaries are located in the United States, Taiwan and the United Kingdom. Garmin, quatix and fenix are registered trademarks and FUSION-Link, StereoActive, UltraTrac, Connect IQ and Garmin Connect are trademarks of Garmin Ltd. or its subsidiaries.